Doris Isabel Gould was born on 21 February 1894 in Sydney, Australia, the fourth child and elder surviving daughter of Nat Gould and his wife Elizabeth Madeline Ruska. 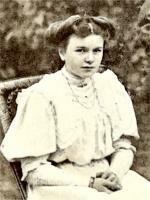 As a tiny baby she moved in the following year with her parents and two brothers to England. 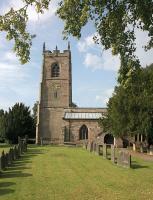 She was baptised on 13 September 1895 at Mayfield parish church in Staffordshire. Probably the christening took place while the family were staying nearby for a month with Nat Gould's mother (1). Grandfather William Wright had lived in a cottage in Mayfield. Later the family moved to Middlesex and settled at Bedfont, near Feltham. Within the family Doris was called Dolly or Doll. On 12 October 1918 Doris Isabel Gould was married to Francis Albert Marryat in St Mary's parish church at Bedfont in Middlesex (2). The bridegroom was a Sergeant in the 8th Battalion of the Australian Imperial Force, serving in London. He was the son of Francis Henry Marryat and his wife Miriam Sophia of 94 Wellington Street, St Kilda, Melbourne, Australia, and was the great-grandson of the novelist Frederick Marryat 1792-1848 (3). 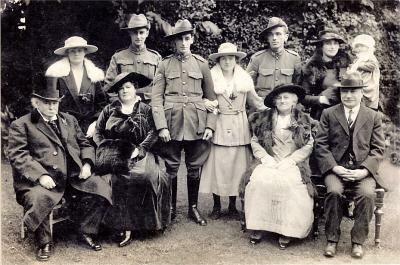 In the wedding group photograph (4) are shown: (standing left to right) Winifred Madeline Gould, Benjamin Francis Marryat (best man), the bridegroom and bride, unknown Australian soldier, and Alice Gould (wife of Sidney Nathaniel Gould) with baby Joan (5), and (seated) Nat Gould and his wife Elizabeth Gould (left) and an unknown couple (right) (6). The newly-married couple immediately emigrated, sailing on the White Star liner SS Dominion. They arrived in Montreal in December 1918, and crossed from Canada into the USA (7). They travelled across America, and sailed from San Francisco for Australia on the liner SS Sonoma, arriving in Sydney on 14 January 1919. They settled first in Geelong, Victoria where the 1919 Electoral Roll lists them as living at 156 McKillop Street, Francis being recorded as a salesman. In 1931 Doris and Francis were living at 1 Hartley Avenue. He was then described as an agent. By 1935 they were in Canberra, at Batman Street in Braddon, Francis Albert then being an accountant. In 1924 Doris Marryat returned to England for a visit. 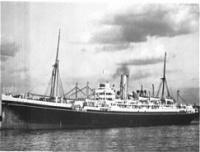 On 14 June she arrived from Sydney aboard the Australian Commonwealth liner SS Largs Bay, without her husband but with two children Francis N. Marryat aged 4 and Betty Marryat aged 2. They were to stay at 94 Teignmouth Road, Cricklewood in London, presumably the address of a relative. On their return home, Winifred Madeline Gould went with them to start a new life in Australia. Doris Isabel and Francis Albert Marryat had four children: Francis Nathaniel (Nat) Marryat born on 14 July 1919, Betty Marryat born in 1922, Lorraine Elva Marryat born on 25 January 1925, and Francis Herbert (Frank) Marryat born on 1 December 1926. In 1950 Doris Marryat was interviewed by a journalist about her father Nat Gould and the writing of his books. That led to the publication of a series of informative articles by W. Farmer Whyte (8). (1) Under the provisions of a Codicil to the Will of her grandmother Mary Gould, a trust fund was provided for her. (2) Church Register of St Mary's, Bedfont. The bridegroom's father, Francis Henry Marryat was born in London on 29 October 1850 but emigrated to Australia in 1860 with his mother and step-father. (3) A report in the New Zealand newspaper the Christchurch Star dated Wednesday 5 February 1919 states that he was the great-nephew of the famous novelist. He was in fact his great-grandson. Captain Frederick Marryat 1792-1848 was a naval hero and author of many books including Mr Midshipman Easy and The Children of the New Forest. Nat Gould would have been delighted by the family connection! (4) The photograph is in the family collection of Nat Gould's great-granddaughter Sue de Groot, and is shown here by her kind permission. (5) Sidney Nathaniel Gould and Frederick William Gould (the bride's brothers) were away serving in the Army. Sidney Gould was in India. (6) The unknown seated couple in the wedding group photograph may not be the bridegroom's parents, as they were living in Australia, but are presumably his relatives. (7) In the record of their crossing into the USA, Francis Albert Marryat was listed as an auctioneer. (8) The articles were published in the Adelaide newspaper The Mail from 25 November 1950 to 1 March 1951. Information kindly supplied by Trevor Byrnes.